One of the beautiful aspects about reorienting household economics is that one by one, we can start generate waves of quiet but important changes. We vote when we buy, in a manor of speaking. In some cases, corporate governance helps hinder our position. Yet, we have the opportunity to use our time and resources in our own unique ways, rather than letting ourselves become inundated with household myths that may or may not actually benefit us personally. We can chose to not shop at unethical establishements, or buy unethically produced products. We can work at building local economies through local purchases. It may be true that specialization creates maximum profit, but profit is not calculated vis-a-vis externalities – that is the vary definition of the external nature of the side effect of production. The issue of paid versus freestyle employment has to be considered on a personal basis. Perhaps more importantly, the household seeks to diversify revenue sources, to mitigate future risks. To the same point, costs are kept low on an ongoing basis and savings are high in good times. Using a wholistic approach, let us embark to create an ever more thoughtful marketplace that takes into consideration our own well-being, as well as the best interests of society at large. We can create that through each little choice we make. The little choices will eventually aggregate into new waves of ‘smart’ and ecofriendly local economies. Finally, always keep in mind – it is not what you earn, it is what you save. There is a strong correlation between savings and wealth, rather than income and wealth. Wealth generation comes from long-term household ‘profits’ saved, year by year, managed wisely, rather than an austentatious consumption. So remember to never, ever compare yourself to anyone else. Looks can be deceiving and also influencers on the psyche. Do not fall into the trap of comparing your possessions with what is possessed by others. You may never know the true situation – so only measure your possessions against your own markers of consumptive satiation. Chapter 1: Who is the New Conserver? Chapter 3: What is ‘Exponential Growth’ and why bother mentioning it? 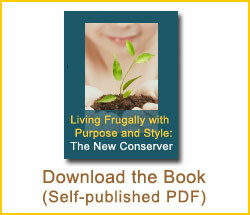 The self-published book by Dolores Hark entitled, "Living Frugally with Purpose and Style: the New Conserver," is now available for download. Dolores has a Master's Degree in Economics and in Sociology from a reknowned U.S. based university. She provides a serious look at how to better manage Household Economics. * © 2008 - 2018 The New Conserver - written by Dolores Hark - This is a self-published title. Any recommendations or feedback welcome. Please write me at dhark at newconserver.com. Please do not quote from this website without explicit written permission of the author - thanks in advance. This domain is on sale. The sale payee is legally Ceed Partnership, Inc., the website developer.